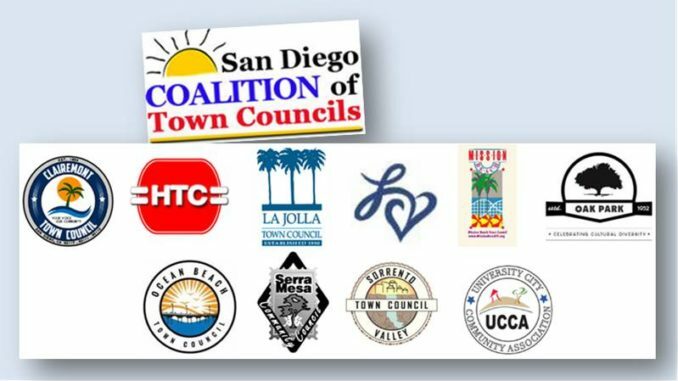 Several months ago, the University City Community Association (UCCA) board voted unanimously to support UCCA’s membership in the newly organized San Diego Coalition of Town Councils. Members include representatives of Town Councils and Community Associations. Originally organized to share information among community leaders related to the short term rental debate, the Coalition now envisions its purpose expanding to sharing best practices, event ideas, funding sources, and community resources. In addition, the Coalition wishes to act as a forum for sharing concerns and to collectively address issues that affect communities throughout the City. Besides UCCA, member organizations include Clairemont Town Council, Hillcrest Town Council, La Jolla Town Council, Linda Vista Town Council, Mission Beach Town Council, Oak Park Community Council, Ocean Beach Town Council, Serra Mesa Community Council, and Sorrento Valley Town Council. For more information, contact UCCA’s liaison Mack Langston at langstonmack@gmail.com.